Patriot Paving offers golf path paving for golf courses, private and public. Patriot Paving is a Wisconsin-based asphalt paving company who is the primary company to call for Golf Cart Paths throughout Tomah, WI. Golf courses can rely on our years of asphalt experience to provide proper cart paths throughout your golf course with quality asphalt pavement. If you want a great golf course, you need clean and well constructed golf cart paths, that improve the look of your golf course and reduce the wear and tear on your golf carts. Patriot Paving has the golf cart paving equipment and years of experience to construct a long lasting golf cart path for your Tomah golf course. Our paving experts install, replace, and resurface asphalt pavements in all sizes and shapes. Whether you golf cart path is old and broken or you are building new cart paths for a golf course, reach out to our golf cart paving specialists today. We own and operate highly specialized golf cart path paving equipment designed to construct or resurface 5 foot to 9 foot wide cart paths. While our competitors attempt to make non-specialized equipment work, we’ve invested in the right golf cart path paving equipment to ensure your golf course paths look and feel just right. Our paving team installs golf cart paths throughout Wisconsin and pretty much anywhere else you may need. Contact Patriot Paving today to get the paving specialists for your golf course in Tomah. We appreciate all of our clients and will respect your golf course to avoid damage and guest disturbance. We understand when working on a golf course we must work quickly and effectively, to get the job done right. We strive to be the one-stop paving shop for all your paving needs. At the end of our work, your golf cart paths will look beautiful and function perfectly for your golf carts. You won’t have to worry about holes, cracks, and unsightly problems along the cart paths. Call our golf cart paving professionals today to fix the water puddling, potholes, loose edges and deteriorating pavement. 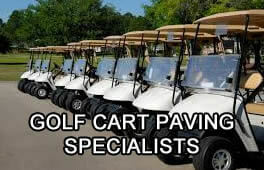 Contact us today to schedule your golf cart paving estimate. We cover the majority of Wisconsin including but not limited to the following cities: Baraboo, Beloit, Dodgeville, Fennimore, Janesville, La Crosse, Madison, Mauston, Mineral Point, Onalaska, Platteville, Portage, Prairie du Chien, Reedsburg, Richland Center, Sauk City, Spring Green, Sun Prairie, Tomah, Viroqua, Waunakee, Wisconsin Dells, Dubuque, Iowa. © 2017 Patriot Paving. All Rights Reserved.